These delicious gluten free Cheesecake Brownie Bars are so hard to resist. Chocolaty moist brownie topped with creamy cheesecake, chopped Butterfinger candy, and fudge. I am in love with Butterfinger candy bars. They are not only gluten free, but they are so fun to bake with. Because of our busy schedule this week, I had to make this recipe over three days. I shopped the first day, baked the gluten free brownie the second day, then finished it off with the cheesecake part the third day. In doing this, it meant tempting candy would be laying around my house longer than usual. I used Butterfinger’s Easter eggs for this recipe, but regular Butterfinger will work too! Grab a bar and smash it up. Sprinkle it on top and bake! I didn’t realize how hard it would be for my husband and kids to resist the temptation of eating the candy. Next came a big “Do Not Eat Until I Say When” sign on the bags of candy. You may be laughing that I need to do this, but if I don’t put a sign on the sweets, it will vanish quickly! It was like our own special family marshmallow test. How long can they resist a chocolate gluten free dessert? Once you try this EASY gluten free brownie cheesecake recipe, you will want to make it again and again. Are Butterfinger Candy Bars Gluten Free? Butterfinger candy bars are safe for those who are gluten free, making it a great candy bar for not only baking but for holiday treats for the kids. Hello, Butterfinger cheesecake and all sorts of desserts. You may have noticed that I have created several recipes using candy over the past few months. Butterfinger is one of my very favorite gluten free candies. Not only is it good on its own, but it adds a crispy flavor to my baking as well. Check out this Gluten Free Baby Ruth Pumpkin Bundt Cake or these Gluten Free Butterfinger Pumpkin Cupcakes! Butterfinger is made out of peanuts and peanut butter, which is mixed with sugar candy to make its unusual texture. Next, it is dipped in chocolate! One of these days I want to try making my own! This gluten free cheesecake brownie bar recipe is by far one of my favorites! I love how easy these cheesecake bars are for using up that extra candy. 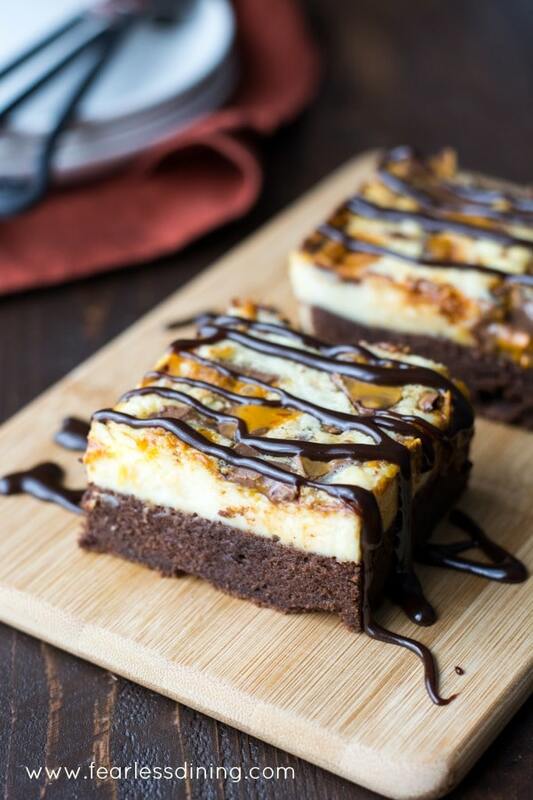 How do you make cheesecake brownie bars? Make the brownie mix, put it in the bottom of the baking pan, and bake it for 20 minutes at 350 degrees. Blend together the creamy cheesecake ingredients and pour on top of the brownie. Top with the chopped up candy and bake. Notice I put the baking pan into a larger pan with water in the bottom. This helps keep the cheesecake moist while baking so it doesn’t crack. Allow to cool fully, slice and slather hot fudge onto brownies, so if you love chocolate, try that :-). Do you have to refrigerate cheesecake brownie bars? You can keep these gluten free cheesecake out of the refrigerator for a day or two…but any longer and you want to keep them in the refrigerator. This recipe should keep for 4 days. Make sure to use a covered container so your bars don’t dry out! Can you use a brownie mix for this recipe? You can definitely use a gluten free brownie mix for this recipe to make it quicker. I like Trader Joe’s gluten free brownie mix, also a company called Brandless.com sells gluten free brownie mix for only $3 a box and it is GOOD! My very favorite gluten free flour blend. It will make these brownies so good, I promise! This non-stick baking pan is just the right size to make these gluten free brownie bars. Easy gluten free Butterfinger Cheesecake Brownie Bar recipe. Spray coconut oil in a 7x7 baking dish. In a mixer, add all brownie wet ingredients and mix. Slowly add in the dry ingredients and mix on low speed. Pour brownie batter into the pan. While the brownies are baking, add all cheesecake ingredients (except for the BUTTERFINGER® Cup Eggs) in a mixing bowl. Mix on medium speed until creamy. Pour the cheesecake mixture on top. Sprinkle the BUTTERFINGER® Cup Eggs on top of the cheesecake mixture. Put the cheesecake pan into a larger pan. Fill the larger pan with 1 inch water. More Yummy Gluten Free Brownie Recipes to Try! Two of our favorites in one bar! These sound so rich and delicious. Bookmarked for later. LOL, these are my two favorite flavors too! By condensed milk, do you mean sweetened condensed milk? It looks amazing! Butterfingers are my favorite candy! Sound wonderful but how about the nutrition information? Hi Pat, I added a nutrition label in. See if that is what you meant. I need to figure out how to space it better as it is almost smushed on the last instruction. Thank you. Wow, nice idea and looks so yummy! These brownie bars looks so delicious and hard to resist! Love using Butterfinger Easter eggs in these brownies! Perfect for Easter! You somehow managed to make brownies, cheesecake, and Butterfingers ALL more delicious! YUM! They look absolutely perfect and indulging! You give vegan a whole new dimension! Hi Katerina, they aren’t vegan…though they are vegetarian. Oh my heavens this is chocolate HEAVEN! Such a beautiful mouthwatering recipe, and gorgeous photos too! Brownies, cheesecake and butterfingers..oh my goodness. All of my favorites in one dessert. I’m sold. I wish I could grab a few bars through the screen. These cheesecake bars look totally scrumptious and my whole family will love these! Awesome 🙂 Thank you for stopping by. OMG, I am drooling, I haven’t seen anything look that good in awhile!! You are so right, they are absolutely irresistible. Butterfinger in cheesecake! Count me in any day. What a stunning recipe! I have some butterscoth to use, it’s perfect! A quick note from Fearless Dining Quality Assurance (a.k.a., Mr. Fearless Dining): these bars are even more amazing warmed up 20 seconds in the microwave. Incredible! When I want to save something from The Hubby I put a “post it” note on it. I’d have to use one to make sure I got a couple of these. Butterfingers were my fave as a kid. Wo the ultimate indulgence. My kids would love this!! This is totally irresistible! Thanks for the gluten free recipe! Can’t wait to have a bite of those ooey gooey brownies! YUMMY! Sandi, you never cease to amaze me with your gluten free desserts. This looks AMAZING! Great shots. These look awesome! I would love one right now. In fact, I’d like two right now! Yum! I can totally understand why you have to put a do not eat sign on stuff too! It happens around here as well! LOL I have extras…wish you lived closer so I could share. What a gloriously decadent treat for Easter! Those Butterfinger eggs are almost possible to resist, and they must be even better with cheesecake. I haven’t yet seen those Butterfinger eggs, but I have a feeling now that I see them the Easter bunny is going to be bringing us some for the basket. I have the biggest brownie craving now. These look amazing.